"My soles magnify the Lord." That's what you'll be saying as you slip into a pair of righteous Shoes of the Fisherman flip-flops. These sandals leave their unique message "in the sand at the seashore, on sidewalks after a rain shower, and on wet pool decks." And "while the words disappear as the sands shift and the sidewalk dries, these footprints leave the greatest impression on the soul." Amen. 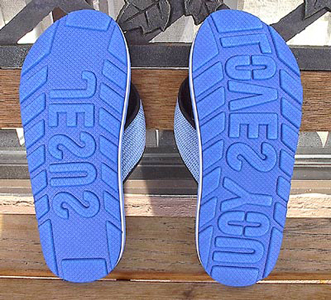 Hand-finished in Thailand, Shoes of the Fisherman flip-flops are blue and white with a contoured insole, and are "waffled to keep feet cool." Take your first steps into a new world of witnessing for just $19.95 (plus postage and packing). Thanks to Karen & Simon Filsell of St Albans for sharing this Gadget with us.